Alexey Nevzorov and Movsar Evloev to fight for interim M-1 Challenge bantamweight title this Saturday night in Ingushetia, Russia. 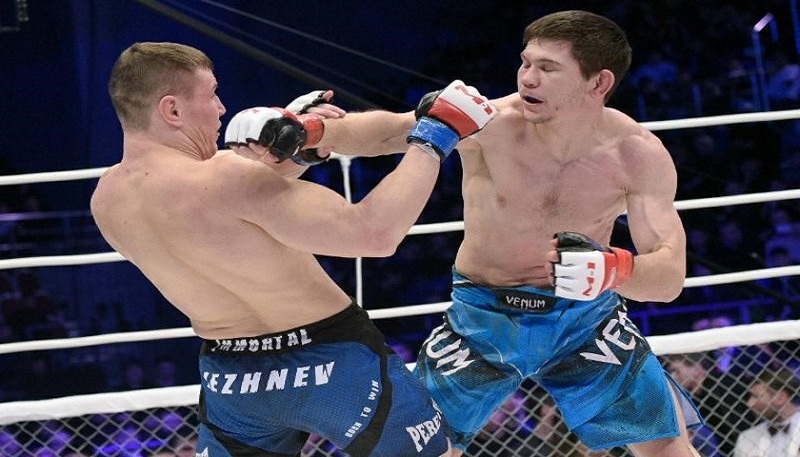 MOSCOW (April 18, 2017) – The M-1 Challenge 76 main card is set, headlined by an Interim M-1 Challenge bantamweight title fight, between top contenders Alexey Nevzorov and Movsar Evloev, for this Saturday night (April 22) in Ingushetia, Russia. The Davella brothers from Brazil, bantamweight Heliton (15-5-0, M-1: 0-0-0) and featherweight Diego (18-5-0), will be in action against a pair of Russian opponents, respectively, Khamzat Dalgiev (8-1-0, M-1: 5-0-0) and Timur Nagibin (8-2-0, M-1: 4-1-0). Another Brazilian fighter, Fabricio “Bill” Sarraff (22-9-0, M-1: 0-0-0), meets Kazakhstan bantamweight Sergey Morozov (6-2-0, M-1: 3-2-0), while German Rene Hoppe (6-0-0, M-1: 1-0-0-) meets Ike Bochkov (2-0-0, M-1: 0-0-0), of Russia. Preliminary card match-ups include Ukrainian featherweight Elnur Valiev (6-0-1, M-1: 0-0-0) vs. Zalimbeg Omarov (7-2-1, M-1: 4-1-1), of Russia, Javier Fuentas (9-4-0, M-1: 2-1-0), of Spain, vs. Khamzat Sakalov (5-1-0, M-1: 4-0-0), Evgeni Goncharov (5-3-0, M-1: 0-0-0), of Spain, vs. Daniil Arepyev (7-1-0), M-1: 0-0-1) in a battle of Russian heavyweights, and Ukrainian welterweight Alexey Valivakhin (8-5-0, M-1: 0-0-0) vs. Ingiskhan Ozdoev (2-3-0, M-1: 2-3-0), of Russia.